Justin's visiting Germany for the government's "Think Transatlantic" exchange program! 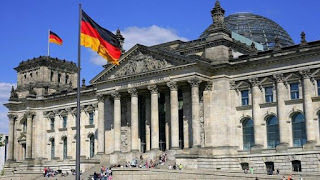 In the spirit of fostering transatlantic dialogue, next week I will travel to Germany to represent the Pacific Council on International Policy during the German Federal Foreign Office’s "Think Transatlantic" Study Tour, an informational visit for young writers and researchers of U.S. think tanks. I will visit Frankfurt, Hamburg, and Berlin to meet with officials from the Federal Chancellery, the Bundestag (Parliament), the Federal Ministry of Defense, the European Central Bank, the Bundesbank (German Federal Bank), the Frankfurter Allgemeine Zeitung newspaper, the Die Zeit newspaper, the German Council on Foreign Relations, the Körber Foundation, the German Institute for International and Security Affairs, the Hertie School of Governance, and more. In a letter to president and CEO Dr. Jerrold D. Green inviting the Pacific Council to participate in the study tour, German Ambassador to the United States Peter Wittig wrote, "In times of myriad crises and shifting global influence, we should deepen our alliance across the Atlantic and ensure its continuity. For this, we need the next generation of government and public policy leaders. To help build that next generation of transatlanticists, the German Embassy over the past years has invited young, promising experts from a select number of think tanks and other institutions to gain firsthand experience in Germany on foreign, political, business, security, media, and economic policy issues." Stay tuned to the Pacific Council’s Newsroom, Twitter, and Facebook during the first two weeks of December 2016 for dispatches from Germany as I engage in a dialogue with high-ranking German decision-makers and government leaders, the scientific community, and members of the media and private sector. Also stay tuned to my personal travel blog, Junket Journal, for posts on my trip to Germany and Geneva, Switzerland.